The only two slots that are ‘open’ though, are ultra-crucial to the fortunes of the team, and leave much room for debate. They centre around the need for a reliable No 4 batsman, the reserve wicketkeeper, and/or an extra all-rounder. 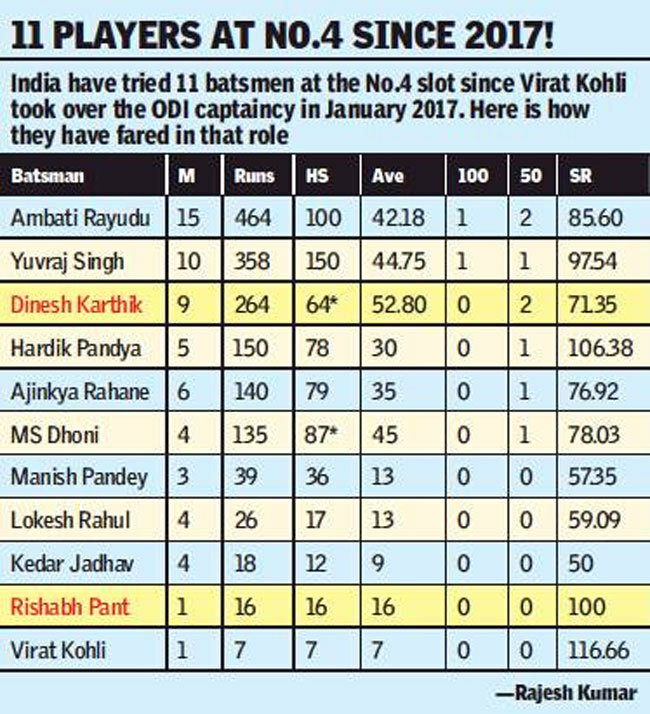 In the battle for the second wicketkeeper’s slot, it’s advantage Rishabh Pant at the moment, despite the youngster enduring a terrible time in the last two ODIs against Australia, where he missed a few chances, apart from failing with the bat in the decider in Delhi. What works for Pant, apart from being an explosive batsman, is that he’s a left-hander. “The team management wants a couple of left-handers (Shikhar Dhawan being the other one) in the top six, so having Pant there will meet that criteria,” a source told TOI on selection eve. It’s for this reason alone that southpaw Suresh Raina was recalled for the ODI series in England last year, but Raina failed to grab his chance. “I would pick Pant as he is a sure shot match-winner. An ideal No 6. He’s a ‘destroyer’ of bowling attacks. He has to be given exposure,” says former India stumper and chief selector Kiran More. “He’s already scored hundreds in Tests outside India. Anyone who does that has to be picked. You don’t have a left-hander other than him. He can fit in anywhere in the batting lineup. Imagine the plight of the opposition if Pant walks in at 200 for two,” he adds. More also shrugged off concerns about Pant’s shaky wicketkeeping, which, many fear, may cost India at some stage in the tournament. “You can see it in the IPL, where he’s been ‘keeping very well. His glovework has improved a lot,” he asserts. However, keeping Karthik out in the cold isn’t a wise idea too. The Tamil Nadu stumper has proved himself to be a reliable man in the middle-order, finishing off games with ease, and sometimes even pulling off miraculous wins-the 8-ball unbeaten 29 in the Nidahas Cup final against Bangladesh in Colombo in 2018 being a case in point. While Pant can smash huge sixes, Karthik’s ability to improvise and conjure up cheeky boundaries is well-known. Pant has shown a tendency to play a risky stroke too many, which may just hurt India at the wrong time. 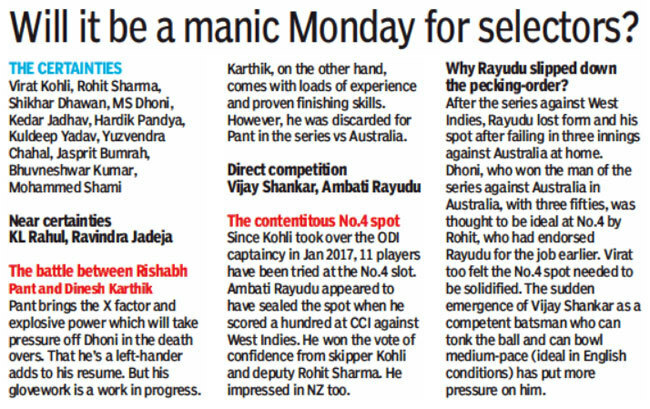 There’s a school of thought that both Pant and Karthik may be picked, with the latter playing as a specialist batsman, but that may mean leaving Rayudu and the impressive-looking Shankar, who’s impressed the team management, out. In case of a shoot-out between Rayudu and Shankar, the Tamil Nadu allrounder may get the nod because of his ability to bat well at No.4, and bowl medium-pace, which would be handy in English conditions. However, More backs Rayudu for his experience. “Rayudu must go, as you need his experience in the WC. I’ll keep Vijay Shankar as a standby. He isn’t a genuine allrounder. He hasn’t scored a hundred in ODIs, so he isn’t an ideal candidate to bat at No 4,” says More.